Why Should I Work Out with a Medicine Ball? What are the Different Types of Medicine Balls? 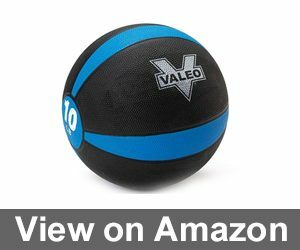 The Valero Ten-Pound Medicine Ball allows users to develop better balance, become more coordinated, and gain more strength. This option works wonderfully for a variety of activities including strength training, plyometric training, muscle building, and one team member noticed that her son with special needs also loves to use the Valero Medicine Ball during his therapy sessions for sensory issues. 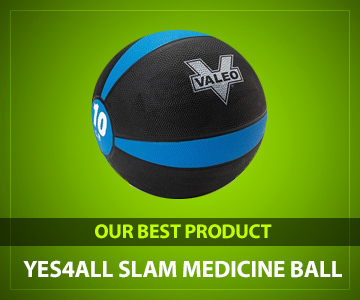 The Valero Ten-Pound Medicine Ball is also available in twelve, eight, six, or four pounds to suit any fitness routine needs. The ball itself is extremely durable and well-made with a very sturdy rubber. A textured grip helps you keep your hands on the ball with a nice, solid grip that is sure to help you achieve your fitness goals. 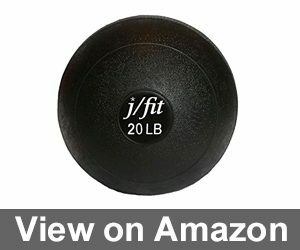 The j/fit Soft Style Medicine Ball is a wonderful and heavy-duty option. 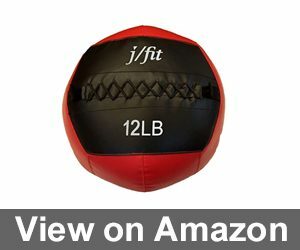 The medicine ball is offered in multiple sizes including six, eight, ten, twelve, fifteen, eighteen, twenty, twenty-five, and thirty-pound sizes, so you are guaranteed to find your perfect weight. Our testing team members found that the j/fit Medicine Ball works extremely well for Cross Fit workouts and her gym now uses them exclusively. 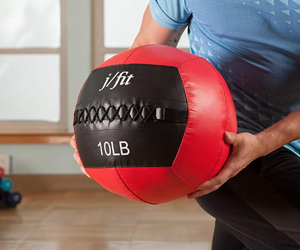 The j/fit Soft Style Medicine Ball absorbs impact to prevent strains or muscle fatigue. Regardless of weight, the ball is 14 inches in diameter. The ball has been specifically designed and crafted to prevent busted seems or losing its shape, both of which can be huge issues in choosing a medicine ball for Cross Fit activities. The SPRI Dual Grip Xerball is an easy to grip ball thanks to the addition of handles on each side of the ball. Our testing team members that have arthritis, carpal tunnel, and other gripping mobility concerns were ecstatic after trying this medicine ball thanks to its special design. The dual handles allow you to grip and use the medicine ball without causing pain in the wrists or hands which can be a very painful problem with other versions. The SPRI Dual Grip Xerball is a terrific choice for abdominal workouts. You can also work on lower body drills as well as a plethora of single-handed exercises. 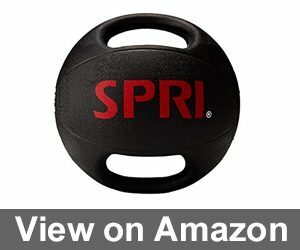 Overall, the SPRI Dual Grip Medicine Ball is an excellent option for keeping fit without hurting your hands and wrists making it a welcome addition to your current home gym. The AmazonBasics Medicine Ball is a lovely budget priced choice that proves you don’t need to spend a ton of money to get in better shape or take charge of your health. Our testing team enjoyed using this classic-style medicine ball for a variety of workouts and activities. 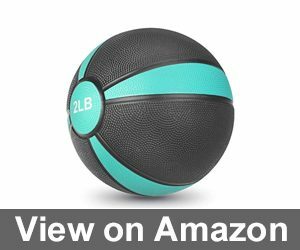 The AmazonBasics Medicine Ball will assist you in developing core strength, better coordination, and easier balancing as well. 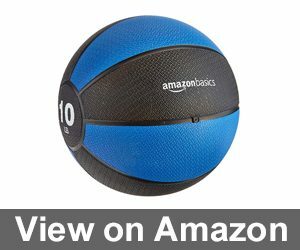 The AmazonBasics Medicine Ball is available in a multitude of sizes with the ten-pound option being our favorite. 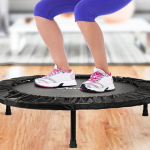 The ten-pound size is perfect for both upper and lower body workouts without the pain or strain of other fitness tools. The ball also bounces well, making it a fun ball for children to play with as well. The j/fit Dead Weight Slam Ball is a Cross Fitter’s dream. The medicine ball helps perfectly during your workout of the day while boosting your aerobic capacity. Slam balls allow you to achieve better cardiovascular health by enhancing circulation while also working to improve both endurance as well as strength. Our testing team had fun trying out new types of exercises with the j/fit Dead Weight Slam Ball. It comes in a diameter of 9 inches with many weight sizes from ten to fifty pounds. The ball can be purchased with or without tread. On the downside, this medicine ball tends to wear out quickly. 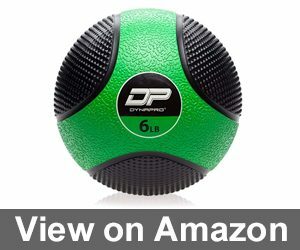 The DYNAPRO Medicine Ball has been carefully crafted with an extremely durable and heavy-duty rubber. The ball is able to withstand heavy use and is the most durable option we tested. Our testing team was excited to find an option that works for bouncing, slamming, and normal wear and tear. The DYNAPRO Medicine Ball is available in four, six, eight, ten, and twelve-pound options. The ball is a wonderful tool for helping you tone your core without the ball slipping away during sweatier sessions thanks to its non-slip textured surface. Overall, this medicine ball from DYNAPRO is a welcome and needed addition to any home fitness room. The TRX Training Slam Ball is a lovely choice for individuals that love to play slam ball. Slam ball engages your entire body to combine power, cardio, and strength exercises together. 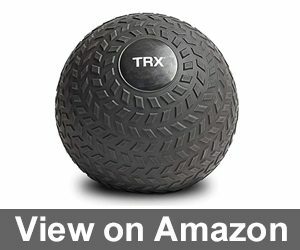 Our testing team had a blast playing slam ball with this budget-priced offering from TRX. The TRX Training Slam Ball is a very durable option and has been created with a heavy-duty rubberized shell. The shell protects the ball during your workout and also absorbs impact rather than bouncing back at you. The surface texture is rugged to allow for a stronger and more comfortable grip. The JBM Medicine Ball was created for use as a slam ball. It is available in many different weights from a light two pounds to a heavier duty 15-pound ball. Our testing team was thrilled to find a very lightweight option for those individuals with mobility concerns. The JBM Medicine Ball has many uses including slam ball, plyometric training, as well as tasks that improve flexibility. The ball is easy to grasp thanks to its textured surface which is a handy feature during slam ball and wall ball. This option from JBM is also created using an eco-friendly, high-quality rubber making it an environmentally sound decision. 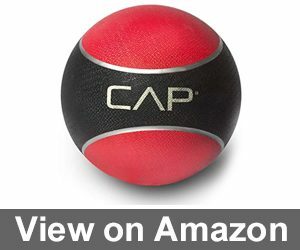 The CAP Barbell Medicine Ball is offered in weights from two pounds up to twelve pounds. Our testing team loved that this version has some bounce to it. Kids and teens will also enjoy using this ball since it is available in lighter weight options. In fact, one testing team member noted that her teen who normally detests exercise actually loved using the CAP Medicine Ball. 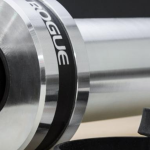 The CAP Barbell Medicine Ball features a textured surface to allow for a stronger grip. We used this ball to play slam ball, work out our cures, and to use in passing drills. This option from CAP does have a tendency to pop when thrown with too much force, so take it easy. 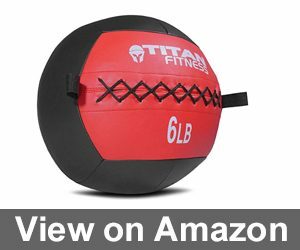 The Titan Soft Wall Ball Medicine Ball is a fierce and heavy-duty option for individuals that have mastered lighter weight medicine balls. The ball is available in sizes from six to twenty pounds. Our testing team members that are used to lifting heavier weights or that are experienced in Cross Fit loved using this option from Titan. It was a bit heavier for our less experienced team members though. The Titan Soft Wall Ball Medicine Ball has been crafted from a high-quality synthetic leather on the outside surface. The medicine ball is held together with tight double stitching to ensure it stays together during heavy use. This soft medicine ball version will not be a great option for slam ball on the downside since it is better suited to other activities like abdominal work, squats, and wall ball. Medicine balls have become increasingly popular in recent years. Finding the best medicine ball for your needs may seem more difficult than running a 5 K marathon. There is a plethora of options available at stores and online retailers alike, each purporting to be the best. While testing the top ten medicine balls, our testing team learned so much new information that we felt compelled to provide a handy dandy buyer’s guide. This guide will help you understand which features are essential and which are overkill. Let’s get started! Eventually, the gladiators started using the medicine balls to practice before entering the arena. Medicine balls were also used in Ancient Persia prior to the invention of free weights to train. 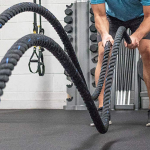 They have continued to be used for fitness and have grown popular once again, in part, thanks to the recent popularity of Cross Fit, an exercise program. Medicine balls are inexpensive when compared to other gym equipment and free weights making them an excellent investment for anyone living on a budget. There are so many exercises and activities that you can perform with a medicine ball making them a versatile addition to your current fitness routines. Medicine balls can also be more fun to exercise with. They will allow you to try new work outs which can help you to push through a stubborn weight loss plateau. Medicine balls can also be a great way to connect with your children. Our testing team found that most children love to help their family members workout by tossing the ball or helping with passing or sit up drills. There are four basic categories that medicine balls fall into. Let’s take a closer look at the important attributes of each version. Some medicine balls are made with handles on the side to allow for a better grip. Keeping a steady grip on the ball during exercise can grow very tiring on your hands and wrists. The addition of handles helps to nip this issue in the bud. It also allows you to do kettle ball style exercises with your medicine ball as well. Medicine balls that have been filled with sand help to keep you safer during use. You are able to slam the ball into the ground without the fear of it whipping back and smashing into your face among other places. There will be some exercises, such as plank variations, that will be very difficult or impossible due to the sand throwing off equilibrium. Rubberized medicine balls are the most popular and commonly used version. They are made of rubber and are perfectly round. This medicine ball option is best suited to abdominal and core workouts rather than throwing or slamming workouts. The rubber allows the medicine ball to bounce which could make for a disastrous injury. Wall balls are sometimes called soft medicine balls. This model is the version that is beloved by Cross Fit athletes worldwide. Wall balls are used in both hand to eye drills, explosive drills as well as wall ball. Wall ball involves squatting down low while holding the ball. You then propel yourself upwards and off the ground, while tossing the ball high up touching the wall then catching it during your descent back down to the ground. Let’s explore some of the fun ways you can use your new medicine ball to work out. Feel free to toss the medicine ball around using a shoulder width apart stance. You can throw with one or two hands. You could also throw the medicine ball while down on your knees or while you are running or jumping to increase the difficulty. Wall ball is a fun way to use the medicine ball as it combines both throwing and catching. You can also play catch with others with the ball. This activity makes using medicine balls with your children a fun and healthy way to bond and spend time as a family. If you do not have free weights at home, your medicine ball can help. You can use the ball to squat, bench press, lunge, row, and more. Picking a medicine ball with handles can help and even perform as a kettle ball. Medicine balls have been utilized for thousands of years as a fun and helpful way to work out and can make exercise more enjoyable. Medicine balls come in a multitude of shapes, sizes, and colors, not to mention weights. Finding the best medicine ball for your needs is simplified when you understand the features you need and which you don’t. We hope you enjoyed reading our top ten medicine ball reviews and that our buyer’s guide was helpful. We love hearing from our readers! Please drop us a short note down below with your favorite medicine ball exercises. Dual grip handles of SPRI Dual Grip Xerball make every workout easier. I like this ball for my lower abs and find it the most convenient on the market. Recommend to those who’re searching for good quality and reasonable price.